Copyright 2012 Burt's Music & Sound. All Rights Reserved. Later that year he joined a heavy blues/rock band from Spokane, WA called Cold Power. He played rhythm guitar and slide. During that time he attended Eastern Washington State College, where he studied string bass and music theory. The spring of 1970 brought a move to Los Angeles, and a new scene. The band became “Cheyenne”, and the music became more commercial, some of it penned by Eric. In the early fall of 1971, the band recorded an EP at Larabee Studios in L.A. and moved back to Spokane to release a single in the Pacific Northwest. The result was “Love and Hate” becoming a #1 regional hit in Boise Idaho, and a double bill with the James Gang at Boise State. In the spring of 1972, the band moved to Seattle and quickly caught on in the club scene. Seattle became home. Known now as “Shyanne”, this time ushered in a prolific song writing period with now world known primitive artist, Terry Turrell. The result was an original sound that provided many opening spots at the Paramount Theater. Many songs and recording sessions culminated in the sale of 3 songs to Marty Balin, lead singer for the “Jefferson Airplane/Starship”, in 1980. Marty’s solo album went gold in Japan, and Eric and Terry received a gold record in 1981. With the ‘80s came a change in music, and many member changes. Then, in 1986, Eric was given the opportunity to join and tour with the world famous blues/rock band “Foghat”. They shared bills with some of the biggest names in music, Bryan Adams, Blue Oyster Cult, Tower of Power, and The Outlaws, just to mention a few. After 3 years of extensive touring throughout the USA, Canada, and a stint in Korea, Eric returned to Spokane for a brief hiatus. He joined local musicians in July ’89 to form the Perones. The Perones came to an end in January of 2011. Eric is currently playing lead guitar with Spokane-based band, Radioface, and studing jazz. In 2001, he started with Burt’s Music and Sound. 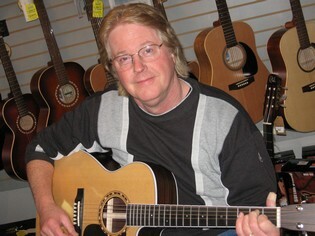 He brings over 45 years of professional musical experience to the Burt’s staff. Coupled with the decades of knowledge of the rest of the team, you have an unbeatable combination. Come in and see if we can make it work for you.